The two paradigmatic acts of God’s redemption in the Bible are enacted through a meal. The Children of Israel were given precise instructions on celebrating the Passover (Exodus 12), a meal commemorating their liberation from Egyptian slavery. In the New Testament, Jesus points to his crucifixion when he takes bread and wine from the Passover table and declares ‘Eat this. . .Drink this. . .in remembrance of Me.” I remember a college anthropology class where we explored the strong link between the sense of taste and memory. I have always have been fascinated by how God has used taste as a means to communicate and call to mind His salvation. Occasionally I’ve wondered why we don’t make more use of tastes and smells in passing on gospel truth to our children. This is what Bake Through the Bible does. 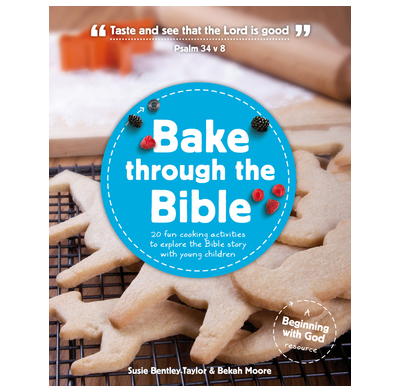 It takes 20 Bible stories, pairs them with a baking activity to do with children. When you pair the power of taste with an action that reinforces learning (i.e. preparing food), you have made learning the Bible a multi-sensory experience. Authors Susie Bentley-Taylor & Bekah Moore open up the Biblical story by recipes for creation cookies, sad pizza faces (because of the Fall), sparkly promise cookies, lamb burgers (passover, kind of), happy crêpe faces, and more. Sometimes the link between the food activity and the biblical episode are fairly direct (i.e. the crucifixion story is followed by a recipe for hot-cross buns and the resurrection by an empty bread tomb with Easter dip). Other times the significance of the baking is more abstract. For example the chapter called ‘God looks after his people,’ describes Psalm 23, the shepherds psalm, and is illustrated by a recipe of ‘Thirst-quenching smoothies.’ This is less direct. The other morning my four-year-old was crying about not having enough crowns (being a royal pain). Evidently her six-year-old sister has many crowns and she only has one. So after we shunted the six-year-old off to catch her bus. I decided to distract her and redirect her royal energies. My four-year-old and I read about God’s promise to David to provide a Forever-King from his line (26-27). She sat and listened to the explanation of how David wanted to build God a palace. God didn’t need a palace but he promised that David’s name would be remembered forever and that one of his descendants would sit on the throne forever. I explained that that Forever-King is Jesus, God’s own Son. Afterwards we set to making sugar cookies. We mixed up the dough and put in the refrigerator. My 2.5 year old emerged from wherever just in time to lick butter and sugar off the beaters. After the dough had cooled, we rolled it out and cut crowns out. As we baked the crowns, I talked more about the passage (2 Samuel 7) and the significance of Jesus’ Kingship. I had to head off to work so wasn’t a part of decorating the crowns (though I did eat one later). Does my four-year-old understand the significance of Jesus’ Kingship or how he fulfills the hopes of Israel? I have no illusions about this. What I do know is that the taste of butter and sugar, and baking with her dad has imprinted a memory and that experiences like this build faith. Bentley-Taylor and Moore have managed to gather together kid friendly, fun activities which illustrate aspects of the Bible. There are photos and illustrations of each step of the process (if you’ve ever baked with kids, you know how important that is). I have previewed the whole book and while I haven’t had opportunity to try every recipe in the book, I am looking forward to exploring it more with my kids. Some of the holiday options sound fun. I give it five stars.